The alpaca belongs to the camelid family of South America and were considered to be royal animals because of their fine fiber by the Incan civilization of Peru. Although they have been domesticated for more than 6,000 years in their native lands (Chile, Peru, Bolivia and Argentina), it was in the1970s that alpacas first entered North America. The surge of enthusiasm for these wooly companions also is increasing in Europe. What is the purpose of raising alpacas? It is commonly known that alpacas spit, but this negative image needs to be corrected. For alpacas, spitting is a form of expression and primarly used in defense against animal predators. They generally do not spit at humans. Alpacas are indeed intelligent animals and are very easy to train. In a short time they can can be trained wear a halter, to jump in and out of automobiles and trailers, to drive a cart, and to carry a pack. Also, once they learn something they don¹t forget it, even over a long period of time. Alpaca fiber is very fine (16 to 28 microns). It is featherlight, lanolin-free, warm and valuable. One alpaca produces enough fleece each year to create several sweaters. What is the character of the alpaca? Alpacas are very social animals. For that reason, they are considered to be a companion species. Simply by observing them, one can see that alpacas are friendly, charming, open and very curious. Their quiet manner and their sympathetic understanding make them very easy to handle for everyone, even small children. Alpacas are very quiet animals. They inform one another of danger with a brief but shrill alarm call. As a general rule, they are inaudible and quietly observe their surroundings. The average lifespan of an alpaca is 20 to 25 years. If they are well cared for they can often live longer. How long is an alpaca¹s gestation period? Alpacas carry their young for 11 1 months. The birth is relatively easy and usually occurs during daylight. The young alpaca, called a cria, weighs between 6 and 10 kilos and begins to walk immediately after the birth. Are alpacas suited for our climate? 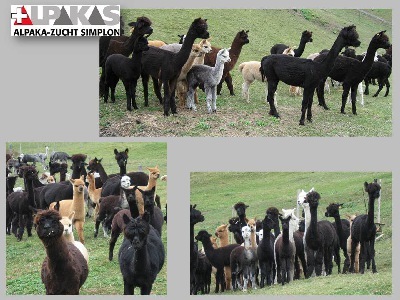 Alpacas are very adaptable to varied climates and are well suited to the Europen climate.